Planet Hugill: Straight or swung? How do you like the Cole Porter Songbook, Sarah Fox and James Burton present their version. Straight or swung? How do you like the Cole Porter Songbook, Sarah Fox and James Burton present their version. How do you like your great American Songbook? In the 1980's I worked with a couple of cabaret groups and we debated this endlessly, they preferred it with a swing in the Ella Fitzgerald mould whilst I liked it more straight, and favoured Joan Morris and William Bolcom. 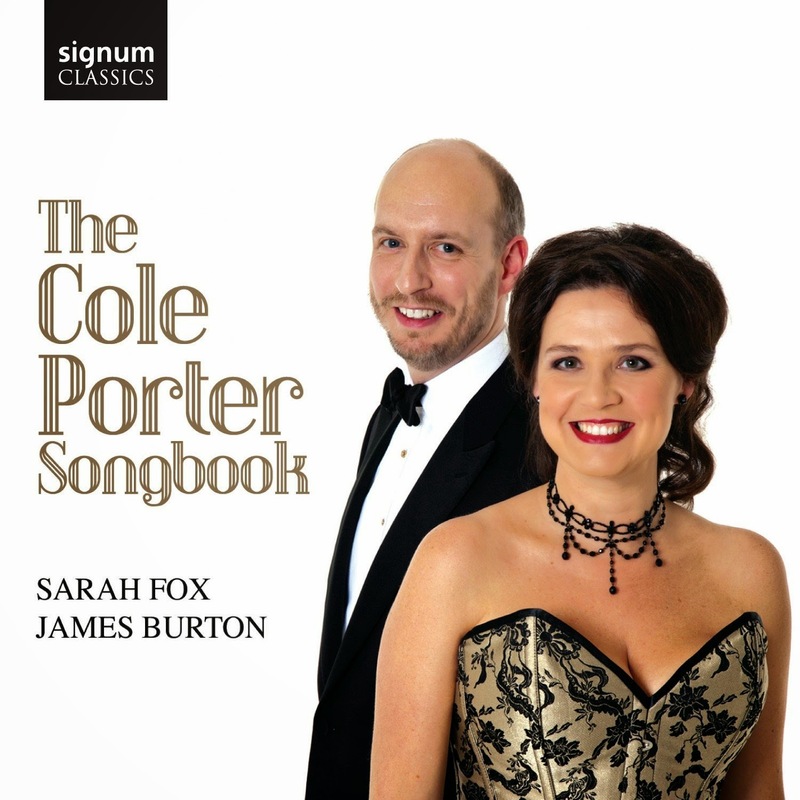 This new disc from Sarah Fox and James Burton on Signum Classics gives us their version of the Cole Porter Songbook, with an interesting selection of songs ranging from classics to the not so well known, Anything Goes to Mrs Lowsborough Goodby, Night and day to Don't fence me in. Sarah Fox has a distinguished career in opera and on the concert platform with performances including Susanna (Le Nozze di Figaro) at Glyndebourne and Royal Danish opera. But she also performers regularly on Friday Night is Music Night on BBC Radio 2, and with John Wilson and his orchestra. She and James Burton have performed this repertoire together for some time. They form a strong and natural duo, with James Burton contributing lively and imaginative accompaniments as well as joining Sarah Fox on some numbers. Any selection of Cole Porter's songs is liable to be partial, as he wrote so many. Here they manage to include many of my favourites including ones like The Physician, Miss Otis regrets and Tale of the Oyster which are classics but which do not always get included in anthologies. These are great songs by any criterion, and they don't need too much doing to them to work their magic. You don't have to swing them to make them work, simply having a feel for the underlying sense of rhythmic flow is essential. Here Sarah Fox and James Burton by and large give lovely relaxed performances which leave Cole Porter to apparently do all the work (but which probably took a great deal of work in the background), they are clearly used to performing with each other and nicely relaxed. Sarah Fox uses vibrato to warm the voice and is not above bending the line for expressive purposes, but wisely she avoids anything that would strongly suggest mannerism. James Burton's accompaniments are sympathetic and engaging, without drawing too much interest away from Sarah Fox. As I have mentioned James Burton joins Sarah Fox for duets and gets a solo of his own in a nicely expressive versions of Where would you get your coat? (perhaps the rarest item on the disc) and Night and day. This being a CD from a classical label, the booklet includes a good article and full song texts. There is much to enjoy on this disc, and generally Sarah Fox and James Burton's performances are right up my street in terms of how I like the Great American Songbook, but I will be skipping a few tracks.